The culture of steampunk has captured mainstream attention. Based on ninteenth-century fashion and technology, steampunk has enjoyed a meteoric rise over the past few years and leaked into popular culture, high fashion and entertainment. Earlier this year, IBM predicted that steampunk will be the big new trend in 2013-2015. This comes as no surprise to Etsy sellers that have seen steampunk items deluge the craft world. IBM’s clue might have been Justin Bieber making a steampunk music video, or LEGO announcing steampunk sets. As the eyes of the commercial world turn to the subculture, independent sellers will need to work harder to stand out. 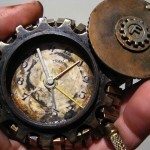 Most sellers creating steampunk items today are making major mistakes that cost them sales from discriminating buyers. Steampunk is broad and offers a lot of creative liberty, but sales will fall flat if you don’t respect the core tenets of the culture. Steampunk is retro-futuristic – it imagines an alternate slice of history occurring after the British Victorian era or American “Wild West” in which steam power has regained mainstream use instead of electric distribution. The time period is set as sometime after the early 1800s when high-pressure steam technology was produced, but before the turn of the century. Early inspiration for the steampunk culture are the works of Jules Verne and H.G. Wells, both prolific authors who wrote in a time straddling the steam and electric revolutions. The then-futuristic visions of these creators imagined fantastic steam-powered machines and automatons, lighter-than-air blimps, pneumatic tube trains and time machines. With this historical backdrop set, it’s easy to see why some items don’t pass steampunk muster. Search for steampunk on Etsy and you’re likely to see dozens of “steampunk” wristwatches; yet wristwatches weren’t popularized until the 1920s. Watches appropriate to the steampunk era would be pocket watches. The mash-up of retro-science and glass has led many crafters to include Nixie tubes on steampunk items. The tubes may seem quaint and historical to us now, but the first commercially-viable Nixie tubes weren’t available until the 1950s. Worse is the amount of steampunk accessories made with plastic. Modern plastics weren’t around until the 20th century, so any hint of plastic in a steampunk item is sheer blasphemy. Creating steampunk items that are true to the culture requires at least a passing Google search to make sure the components fit in the time period. Do your research and make it clear on item listings that you’re representing steampunk accurately. The Just Glue Some Gears On It (and Call it Steampunk) music video has become an underground hit, poking harshly at items trying to cheaply cash in on the steampunk trend. Gears, pistons and valves were common in the age of steam engines – but they served an important purpose. 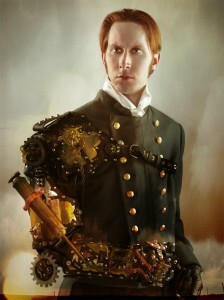 Gears glued on bracelets and other places where they have no use goes against the utilitarian nature of steampunk. The most successful steampunk items capture the mechanical spirit of the times. 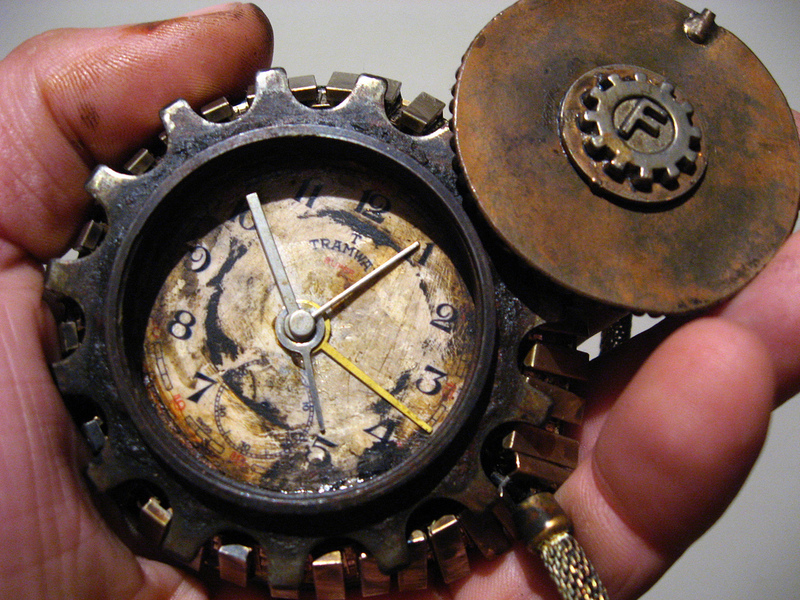 Gears are a cop-out – a cheap way to make your item “steampunk-inspired” without requiring any real creativity. Successful steampunk items use gears in a functional way, or at least attach them in places where you can imagine them serving a purpose. Imagination and research are key to creating “authentic” steampunk pieces. It helps tremendously to read classic steampunk novels – Gibson’s The Difference Engine, Jeter’s Infernal Devices, or any of the then-futuristic books by Jules Verne and H.G. Wells. Imagination is critical when developing an idea for a steampunk item; what’s the story behind it? Instead of piecing together gears, start with an idea and imagine how it would work. Is the ring a key to a time machine? Does this wooden phone case need tubes to transfer power, or a Fresnel lens to enhance the screen? 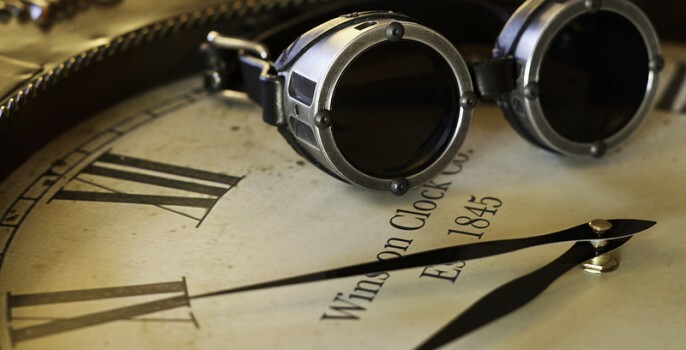 The technology from the steampunk time period dictated which materials were commonly used – or available at all. Brass was a heavily-used metal due to its bright gold-like appearance, smooth surface and low cost to manufacture. Steel had been around for a long time, but it was pricey – the industrial processes to produce it quickly and cheaply weren’t pioneered until the late 19th century. What we know today as stainless steel would come even later, in the 1920s – beyond the time period of steampunk. The Industrial Revolution revolutionized the textile industry – steam power, spinning frames and especially the cotton gin made the previously labor-intensive production of cotton fabric a tremendously profitable business. Leather was a popular choice for accessories since it could withstand rugged conditions. Wood construction was the standard for most household items, since it was widely available and much easier to work with than metals. Rivets were commonplace as mechanical fasteners – bolts had yet to become standardized and arc welding was not yet invented. Home decor items in the Victorian age tended to use darker fabrics, since soot was prevalent from coal mines of the time. Since the washing was done by hand and less frequently, fabric that wouldn’t show soot as quickly was favored for curtains and other washable items. Independent creators are in a prime position to offer more genuine steampunk items – big companies looking to cash in on the trend don’t get it. Fire up your steam-powered imagination and walk like a Neo-Victorian into the hearts of steampunk fans across the world. Steampunk made correctly is hard to come by. Cover image by Pierre-Alexandre Garneau on Flickr. Pocket Time Piece by Don Urban on Flickr. Replacement Arm by BruteForceStudios on Etsy. 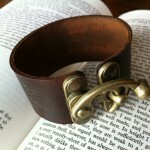 Leather bracer by FiendishWear on Etsy. Thanks so much for the info. I’ve played with this some and didn’t quite understand the ins and outs.